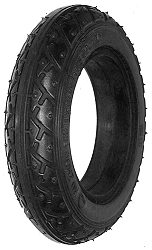 Browse for tires by vehicle make and model. 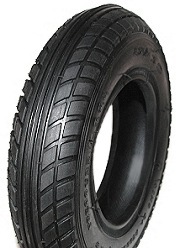 Heavy-duty 100% solid rubber tire with v-style street tread design. 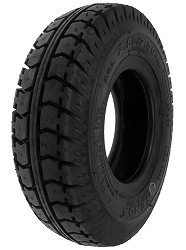 Solid rubber tire construction provides maximum reliability and durability. Airless tires will not loose air or go flat if cut or punctured. 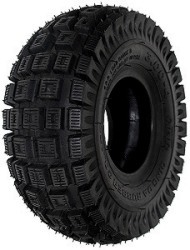 Heavy-duty thick rubber electric scooter tire with all-terrain tread. Maximum recommended inflation pressure 36 PSI. 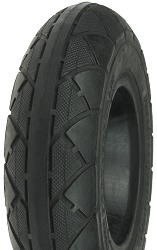 Heavy-duty thick rubber electric scooter tire with ribbed street tread design. 6 ply rating. Maximum recommended inflation pressure 90 PSI. 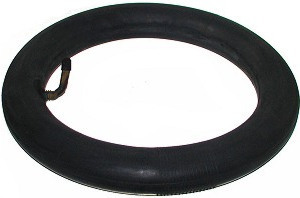 Heavy-duty thick rubber electric scooter tire with street tread. Maximum recommended inflation pressure 60 PSI. 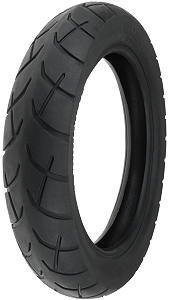 OEM rear tire for the Pulse® Super B electric scooter. 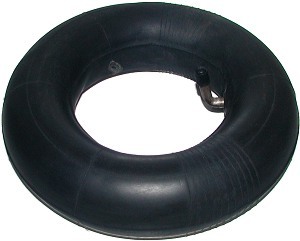 Electric scooter inner tube with bent valve stem. Black rubber street tread electric scooter tire. Maximum recommended inflation pressure 36 PSI. 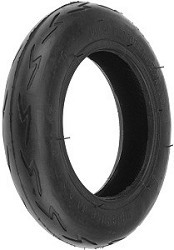 Non-marking grey rubber electric scooter tire. Maximum recommended inflation pressure 36 PSI. 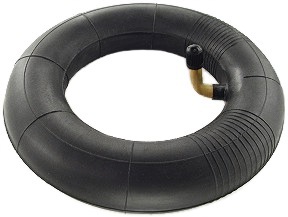 Electric scooter inner tube with straight valve stem. Heavy-duty thick rubber all-terrain tread electric scooter tire. Maximum load 250 lbs per tire. 4-ply thickness rating. Maximum recommended inflation pressure 36 PSI. 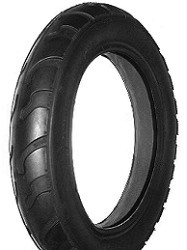 Heavy-duty thick rubber street tread electric scooter tire. Maximum load 250 lbs per tire. 4-ply thickness rating. Maximum recommended inflation pressure 50 PSI. Heavy-duty thick rubber all-terrain tread electric scooter tire. Maximum load 250 lbs per tire. 4-ply thickness rating. Maximum recommended inflation pressure 50 PSI. 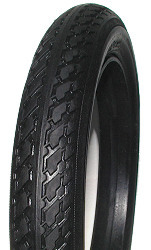 Heavy-duty ribbed street tread electric scooter tire. Maximum load 250 lbs per tire. Maximum recommended inflation pressure 50 PSI. 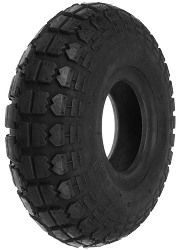 Heavy-duty knobby/turf tread electric scooter tire. Maximum load 250 lbs per tire. Maximum recommended inflation pressure 36 PSI. 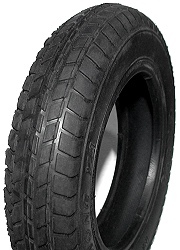 Heavy-duty 100% solid rubber tire with v-style tread design. Solid rubber flat-free tires provides higher reliability and better durability than flat-free tires with urethane foam centers. 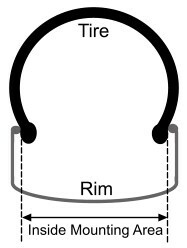 Fits rims that are 1-1/2" wide on the inside mounting area. Airless tires will not loose air or go flat if cut or punctured. 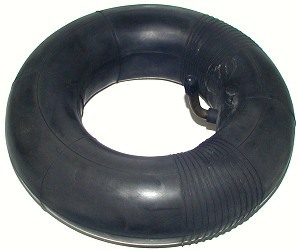 Heavy-duty rubber tire with high density urethane foam center. 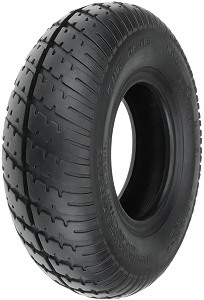 V-style side tread design with center rib for low rolling resistance. High density urethane foam center provides a softer ride and better traction than solid rubber flat-free tires. Fits rims that are 1-3/4" wide on the inside mounting area. Airless tires will not loose air or go flat if cut or punctured. Heavy-duty all-terrain electric scooter tire. Maximum recommended inflation pressure 85 PSI. 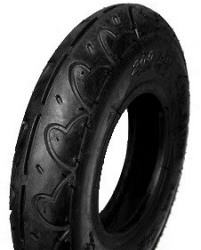 Heavy-duty thick rubber scooter tire with street style tread pattern. 4-ply thickness rating. Maximum recommended inflation pressure 45 PSI. 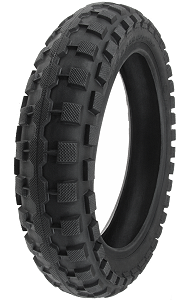 Heavy-duty thick rubber scooter tire with all-terrain style tread pattern. 4-ply thickness rating. Maximum recommended inflation pressure 50 PSI. Electric scooter tube with bent valve stem. Heavy-duty thick rubber electric scooter tire with knobby turf style tread. 4-ply thickness rating. Maximum recommended inflation pressure 35 PSI. Electric scooter tube with standard bent valve stem. Electric scooter tube with parallel bent valve stem. 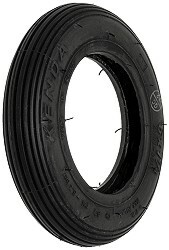 Heavy-duty thick rubber scooter tire with V-style street tread pattern. 4-ply thickness rating. Maximum recommended inflation pressure 45 PSI. 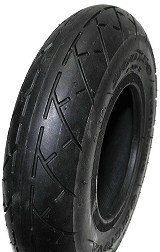 Heavy-duty thick rubber scooter tire knobby style street tread pattern. Maximum load 375 pounds. 4-ply thickness rating. Maximum recommended inflation pressure 40 PSI. 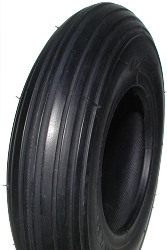 Heavy-duty thick rubber electric scooter tire with knobby turf style tread. 4-ply thickness rating. Maximum recommended inflation pressure 50 PSI. 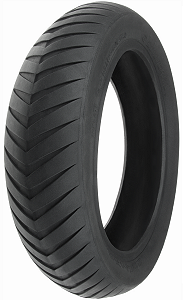 Qind® heavy-duty 10x2 (54-152) electric scooter tire with all-terrain style tread. 4-ply thickness rating. 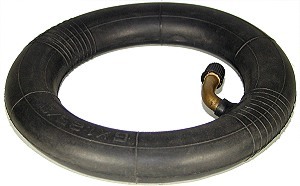 Maximum recommended tire inflation pressure 50 PSI. 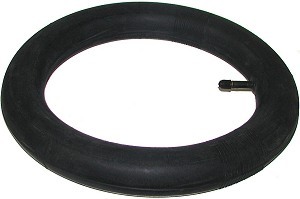 10x2 electric scooter inner tube with standard bent valve stem. 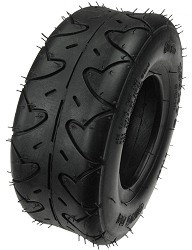 Heavy-duty 12-1/2"x2-1/4" street tread electric scooter tire with S-style street tread pattern. 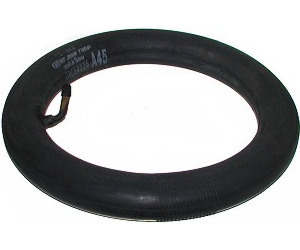 Although this tire can be used on a bicycle it is much thicker than most bicycle tires and made specifically to handle the extra weight and power of an electric scooter. Maximum recommended inflation pressure 40 PSI. 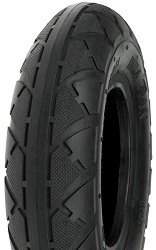 Heavy-duty 12-1/2"x2-1/4" street tread electric scooter tire with X-style street tread pattern. 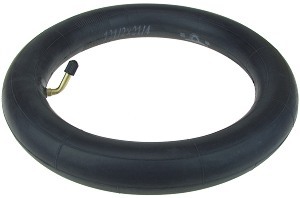 Although this tire can be used on a bicycle it is much thicker than most bicycle tires and made specifically to handle the extra weight and power of an electric scooter. Maximum recommended inflation pressure 40 PSI. 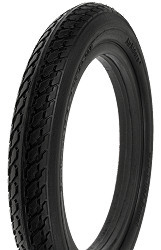 Innova® Sable® street tread bicycle tire. Maximum recommended inflation pressure 35 PSI. 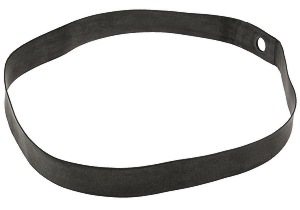 Replacement rubber rim strip for 12-1/2x2-1/4 wheels. Protects inner tube from getting flats from sharp spoke ends. 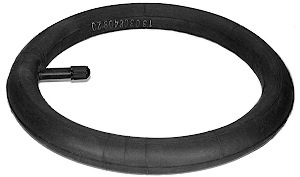 Soak these tires in hot water to soften tire before installing. Airless flat-free solid urethane foam rubber tire for spoked steel or aluminum wheels. Will not loose air or go flat if cut or punctured. 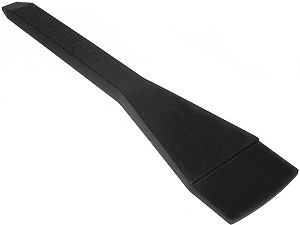 Measures 1-3/4" at the widest point and has an 11" outside diameter. Fits most rims with a 1" through 1-1/8" wide bead seat with a depth of 3/8" or more. 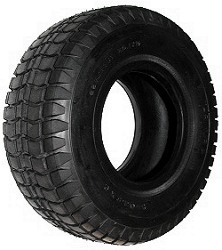 Airless flat-free solid urethane foam rubber tire for spoked steel or aluminum wheels. Will not loose air or go flat if cut or punctured. Measures 1-9/16" at the widest point and has an 11" outside diameter. 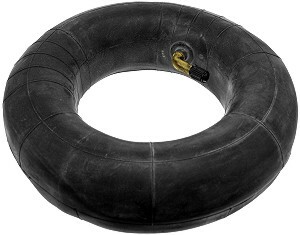 Fits most rims with a 1" through 1-1/8" wide bead seat with a depth of 3/8" or more. Airless flat-free 100% foam urethane rubber tire for cast aluminum or plastic wheels. Will not loose air or go flat if cut or punctured. Measures 1-9/16" at the widest point and has an 11" outside diameter. Fits most rims with a 7/8" through 1" wide bead seat with a depth of 1/2" or more. 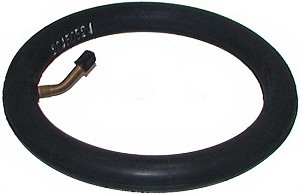 Designed to help remove and install air-filled and airless flat-free scooter and bicycle tires. Heavy-duty all-terrain 12-1/2" x 2.5" electric scooter tire. This tire is sometimes marked 12.5x2.5. Maximum recommended inflation pressure 40 PSI. 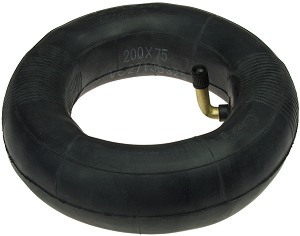 Inner tube for 12-1/2x2.75 heavy-duty knobby tread tire sold above.